The following was prepared for our 70th Anniversay in 2015. It was written by Penny Cockell, the daughter of one of the founders, Valerie Shepherd, to read out at our commemorative Open Days. During World War II there was a Concert Party in Seaford to which many of the founder members of the Seaford Dramatic Society belonged. This had entertained both the local troops and residents during the war years. The people involved had had so much fun with this that they decided to form a Society to continue with this after the war. As a result the Seaford Amateur Operatic and Dramatic Society was formed in the Autumn of 1945 with two sections – the Operatic Section and the Dramatic Section. This was the beginning. There were 35 Members of the Dramatic Section of the Society – they were the Founders – there are just 2 remaining. Valerie Shepherd, the current President (my Mum) and Gloria Roberts (then Bray) who are both in their 90s now. They produced their first play At Mrs Beams in the November of 1946 which was entered into the Sussex Full-Length Play Festival and, following performances locally at the (Clinton Halls), was selected from the 11 other local society productions to be staged again at the non-competitive Finals Day at Glyndebourne Opera House on December 7th 1946 in the evening. 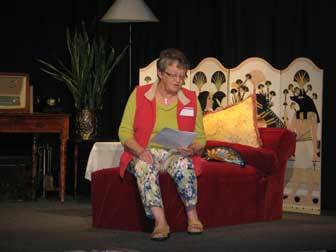 The afternoon performance was When We are Married by the Cuckmere Valley Players. In 1949 it was decided that the two sections of the society should continue separately and so the Seaford Dramatic Society was 'born'. During these early years rehearsals took place in hired rooms (The Assembly Hall – rooms above what is now the Bicycle Shop on the corner of Clinton Place opposite Fox's Estate Agents and Granny's Tea Rooms – now partly Oliver's Restaurent and neighbouring shops on Clinton Place). As well as acting the members made and painted their own scenery, usually in what is now the working end of Mardon Motors on Steyne/Ashurst Road – which was then part of French's Garage (Val's father was Jim French). Once complete the scenery was taken to the Hall where the production was to be staged on a handcart borrowed from a local supporter. The plays were performed for just 3 nights only until the Society were able to buy their own Theatre which they did in 1954. The membership had grown since the Society was formed and so in 1953 it was decided that they should try to buy their own premises to convert to a little theatre and the Christian Science Hall in Steyne Road was available at a cost of £1000, which was raised by appeal to all the local supporters and members who bought shares at a cost £1 per share. The money was raised and the permissions to convert the Hall obtained and the Little Theatre was, at last, the home of the Seaford Dramatic Society in 1954. Now the work could really begin to convert what was a 'church' with a pulpit into a Theatre. To quote from Val Shepherd's notes 'In the summer of 1954 the hall was ours' - the accumulated scenery, props etc was moved from the various places where it had been stored to our new home. Three weeks later, in the August of 1954, the sea wall was breached in the 'big storm' that swept around the country from North West Scotland, down the North Sea and along the English Channel and flooded the just purchased building to a depth of 15 inches destroying much of the scenery which had been stored there. Time to clean up again. The drying out and conversion of the buildings (there were two halls the main one which became the Theatre and the back one which housed dressing rooms, make-up area - proper Leichner greasepaint was used then -, props, toilet, gas stove etc with a grassy area between) took until the end of 1956 when the first production on the small stage (much smaller than now) a play called Black Chiffon was performed. The official 'Grand Opening' was at the beginning of the following year when Without The Prince by Philip King (who attended on the opening night) together with local dignitaries. During all the time that this work was going on (1954 - 1956) the Society continued to produce 3 plays a year usually at the Clinton Hall. The money that had been 'loaned' by the purchase of the shares that enabled the building to be bought was paid back in 10 years. Each year £100 was repaid by means of a lottery – drawing out names of folk who had purchased shares and paying back these people. Some accepted the repayment but many just said 'keep it and put it towards your funds'. In 1961 it was decided that a covered way between the two halls should be erected - planning permission was obtained and this was built in 1962. There was no coffee room in the early years so coffee and tea was made in the back hall using a gas stove and served to the audience in their seats - (I remember both my Grandmother and her best friend stirring the coffee in big saucepans over the stove before the steaming cups were carried on trays across the 'bridge' between the halls). Actors had to run outside through the grass to enter from stage right whatever the weather as there wasn't even a path to run along in those days. In 1971/72 there was a plan to re-develop the site with flats and a new theatre. Developers were interested and plans and permissions obtained. The Theatre was stripped of its lights etc and for 18 months nothing happened. In the end the Developers ran out of money and never started. During this time shows and rehearsed play readings were performed in rented rooms but eventually it became apparent that this wonderful idea was not going to happen. Another Developer (local supporter) stepped into the breech and wanted to build a New Theatre for us in the town however permissions could not be obtained as the land had been earmarked by the local council for other purposes. Between 1983 to 1985 further development took place and another 'Appeal Fund' was launched to enable the two halls to be joined together creating a much bigger stage with backstage and working areas in the grassy area between the halls. Building a proper coffee lounge and toilets - for our audiences - and improving the dressing rooms, green room and storage for costumes props etc - for the cast and backstage crew. This was carried out by Manpower Services, an inititiative set up the the Local Authority who provided a Foreman and Helper to give local young unemployed people some instruction in the building trade. The Society didn't have to pay the wages of the Foreman or workmen but did have to cover all costs of materials. From 1984 onwards the Society has performed 4 plays a year – this began originally to expedite the repayment of the loan obtained to cover the expenses of the re-development of the site to enlarge the stage and make our audience and members more comfortable. The new spiral staircase up to the lighting box were also purchased very recently with the help of a legacy from a member who was both actor and lighting man. Continuing improvements to the lighting, backstage areas, decoration of both inside and outside have been done over the years by members with their own special skills and interests as well as employed professionals and the costs covered by letting the hall, grants from the local authority and enough 'bums on seats' to enable profits to be made on productions. If you would like more details of the productions they are usually to be found in folders covering all the years from the very beginning in the coffee room together with some cuttings and programmes. There are more still to be added, in due course, from boxes in at least one loft I am sure. Members of the Society are really a big family stretching back over the years and have had so much fun as well as putting in lots and lots of hard work to make this the place that it is today. It is their combined 'passion' for Theatre in all its forms that has built this Society. They have worked together, learnt words together, cleaned and toiled together to ensure that each event is a success. They have encouraged each other, fought with each other but most of all loved each other. I have grown up here. I was 6 months old when the Society was first formed and really it is my mother's other child. I've helped clean up (in my wellie boots) in the floods of 1954. Helped at jumble sales and coffee mornings. Come to Ballet lessons and Ballroom lessons with Miss Russwurm between 1958 and 1960. Run across the covered way in very little clothing in The Brides Of March in 1963/64. Served tea and coffee from trays before there was a coffee lounge. Enjoyed the various social events over the years as well – quizzes, car treasure hunts, sausage sizzles, play readings, parties of all kinds etc. The very first I remember was when I was just about 5 or 6 - I was woken up and dressed up as the 'New Year' and joined a much older member who was dressed as the 'Old Year' at a Dinner Dance probably at the Esplanade Hotel. My Mum loves this Society and has enjoyed every moment of her time on and off stage ever since she was one of the people who helped to 'make it happen' in 1945. Thank you Mum, I have cribbed most of this from your writings and thank you for keeping all the historical papers safely including all your AGM reports when you were Chairman and letters etc from the early Secretaries. Penny Cockell (nee Shepherd) – August 2015.